Pacification is an imprecise term. The Oxford English Dictionary states that to pacify is "to reduce to peaceful submission, to establish peace and tranquility in a country or district." Although the Americans, like the French before them, saw pacification in the broadest sense of those terms, both usually thought of pacification as a specific strategy or program to bring security and political and economic stability to the countryside of Vietnam. But there was never agreement among Americans in Vietnam on just what pacification was and how it might be achieved. Some saw it as controlling the population; others as winning the people's allegiance. Some viewed it as a short-term military operation aimed at quashing opposition; others as a long-term process of bringing, in addition to security, economic, political, and social development to the people. Yet even that definition alluded to a fundamental cleavage over priorities that plagued American efforts at pacification in South Vietnam, one that CORDS was set up to eliminate: security versus development or, put another way, military versus civil. agency they worked for, saw pacification as either civil or military but not as a joint civil-military process. Most military men and some civilians believed that there had to be security before economic, political, and social development could proceed, that the people had to be safe before the government could win their allegiance. The converse, to which most civilian officials adhered, was that economic, political, and social development would foster political allegiance and, in time, bring military success, because an insurgency without popular support would wither for lack of roots. That dichotomy reflected an even more basic conflict in the entire American approach to the war: Was the war primarily military, to be fought with essentially military means, or was it basically a political struggle? Although the U.S. government never formally resolved that question, the resources and emphasis devoted to the military side constituted a de facto policy decision in favor of a military solution. Indeed, such a "security first" approach to pacification may have been, after the first few years of the 1960s, the only realistic path. The South Vietnamese people by that time had seen too many programs and too many governments; they had been prey too often to the ebb and flow of struggle in their villages to put their trust in anybody who was unable first to protect them. Yet despite the emphasis on security, pacification continued to founder for lack of sustained security; and what was in effect two wars, military and political, flowed in parallel but separate streams. By 1966 the separation and degree of emphasis on the military war were so great that President Johnson, to give pacification more attention, began to speak of it as "the other war." Yet it was a rare ambassador who used fully the authority that order afforded him. The first and probably most important reason was the situation in Washington, where interagency battles and jurisdictional disputes were magnified and interests supporting each agency were solidly entrenched. It followed that representatives of the agencies in South Vietnam failed to consider themselves members of the ambassador's staff but instead looked to their home offices for guidance and direction, particularly in regard to programs and budgets. Nor were most ambassadors either trained or inclined to be managers. Following years of custom, they tended to view their task as reportorial and representational. Yet even when they tried to exercise more than general coordination, they faced formidable obstacles. By its very nature, the CIA zealously guarded its operational secrets, and military representatives could appeal to a powerful and well-endowed bureaucracy in Washington with institutionalized ties to the Congress and the American public that far outweighed those of the Department of State. The size of the US program further aggravated the ambassador's difficulties in South Vietnam. The AID mission there was one of that agency's biggest, and even in the late 1950s the Military Assistance Advisory Group was the largest advisory group in the world and the only one commanded by a three­star general. In 1961 President John F. Kennedy made two decisions that perpetuated the lack of centralized control in South Vietnam. In May of that year, rather than appoint single managers in the field and Washington to oversee all US operations related to the war in South Vietnam, he reserved responsibility for coordination and direction to himself, his White House staff, and ad hoc interagency task forces that turned out to exercise little real control. Later in the year he sharply increased the size of the American military commitment in South Vietnam and super­imposed over the existing Military Assistance Advisory Group a full military assistance command headed by a four-star general who was equal in rank to the ambassador, actions which made it more difficult than ever for the ambassador to manage the military. for improved organization for the overall American effort and for pacification. Those suggestions, and in some cases concrete experiments, came from every agency involved in South Vietnam and from the White House. Although the president took some part in those proposals and experiments, they were for the most part the province of government agencies which fought over them with little apparent intervention or influence from the president. The agencies groped in vain for a solution. Their failure was to be the catalyst for a presidentially imposed solution in 1966 and 1967. Several factors were responsible for the interest in reorganization that arose during 1964 and 1965: The war was expanding in size and intensity; the South Vietnamese government was marked by weakness and instability; that government also adopted a new organization for pacification; and the commitment of American resources was rapidly growing. The expanding war, soon involving not only the insurgent Viet Cong but also the North Vietnamese Army, dictated an increased American and South Vietnamese military response, which reinforced the perception of the struggle as basically military. Although many officials still maintained that pacification was the key to the war, the assignment of priorities and resources favored the military more than ever. In the face of enemy forces that had grown from small bands of insurgents to regular divisions, it was hard to argue otherwise. Although South Vietnam had experienced eight years of relatively stable, if authoritarian, rule under President Ngo Dinh Diem, that changed suddenly in November 1963 when a coup d'etat and Diem's death in the course of it turned the government over to inexperienced generals. Amid changing and unstable governments, Americans found themselves involved in internal South Vietnamese politics and administration in a way Diem never would have countenanced. Although eventually rejected, joint American-South Vietnamese command and infusion of American advisers directly into the South Vietnamese government were seriously discussed both at the US mission in Saigon and in Washington. tion (later called Revolutionary Development); and that produced similar contentions from American civilian officials that either the embassy or the United States Operations Mission, as the Saigon Office of the Agency for International Development was then known, should manage the American pacification program. Probably the greatest impetus for organizational change was generated by the growing commitment of American resources. During 1964 and 1965, the American military strength in South Vietnam grew from less than 20,000 to nine times that figure, and civilian representation increased correspondingly. 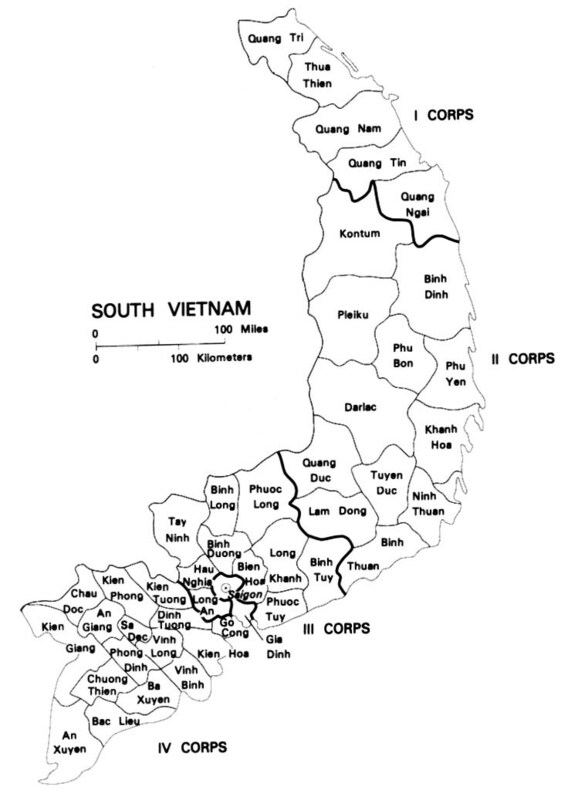 A major increase in the American advisory program started in early 1964 when the American military headquarters, the Military Assistance Command, Vietnam (MACV), began to place small advisory teams in South Vietnamese districts (similar to counties in the United States). Within a year almost all of the 243 districts had them, and military advisory teams at the province (state) level expanded as well. American civilian agencies also placed their own representatives in provinces and many districts, so that the advisory effort was soon too large and too remote for any Saigon-based ambassador to control. It was no rarity for several American agencies to present conflicting advice to South Vietnamese officials at various administrative levels. In Washington, President Johnson clearly was the man in charge on Vietnam, but only on those issues of high policy or immediate necessity that he chose or found time to deal with. There was still no individual, committee, or task force below the presidential level in charge of either the war as a whole or pacification. Although in 1964 Johnson created an interagency Vietnam Coordinating Committee within the Department of State to manage policy and operations, that committee failed to deal in major policy decisions or to manage operations. Taylor commanded great respect within the military. He was apparently the ideal man to mesh the military effort with the civil and political aspects of the war. Few if any American ambassadors have entered on their assignments with such a formidable combination of personal respect and presidential authority and backing. Yet at the end of Taylor's tenure a year later, the US mission had larger, more fragmented bureaucratic fiefdoms than ever. cept by setting up what he called the Mission Council, in his mind a miniature National Security Council. The members were the ambassador, his deputy, the embassy's political and economic counselors, and the heads of the other American agencies, including the military commander. An executive secretary known as the Mission Coordinator prepared the agenda, recorded decisions, and followed them up. The council met weekly by itself and also held periodic meetings with the South Vietnamese National Security Council. Interagency subcommittees, chaired by the agency having primary interest, dealt with special areas of concern. Although the ambassador retained final authority, the object was to achieve a consensus, especially among staff officers, before issues even reached the formal meetings.5 Despite the existence of this council, agencies were allowed to appeal council decisions to Washington, which reinforced the concept of the ultimate independence of each agency. There was no open defiance of the ambassador, either by Westmoreland or the heads of any of the other agencies; for Taylor was unquestionably the figure of authority in the US mission. It was merely that in the absence of firm direction to pull the mission together, something Taylor apparently saw as unnecessary,9 the agencies continued to go their respective ways. And the beginning of the massive American build-up during this period aggravated the problems of disunity. During the same period (1964-65), however, the beginning of what was later known as the Revolutionary Development Cadre Program sharpened the dichotomy between military and civilian operations. Considering that neither the American nor South Vietnamese military was devoting sufficient emphasis and resources to pacification, American civilian agencies threw their support behind an expansion of the People's Action Teams. Started under CIA sponsorship, the teams were local­defense platoons, trained extensively in political indoctrination and motivation, that lived and worked among the people. Vastly expanding the number of teams, the South Vietnamese absorbed some members of existing programs run by separate government ministries but also gathered new recruits. Requirements for scarce South Vietnamese manpower conflicted with military needs, and the program became a major point of contention between American civilian agencies and General Westmoreland's command. In the meantime, American bombing of North Vietnam beginning in February 1965 and arrival of American ground troops starting the next month and their commitment later in the year against the enemy's main-force units, produced more and more emphasis on military action and thus less and less American military attention to pacification. Immersed in their own expanding pacification program, American civilian agencies felt a widening conceptual gulf between the military war and what they were trying to achieve. While admitting that organization for pacification support might be tightened, they believed it should be achieved under civilian direction. Contributing most of the advisers and materiel and responsible for security, the American military command preferred to leave the organization as it was rather than see its resources put under civilian management. In Saigon, in an effort to coordinate the advice given South Vietnamese province chiefs, the US mission tried an experiment in three provinces, designating three "team chiefs," from AID, MACV, and the embassy. Although the test worked well in at least one province, it was abandoned after three months because of inconclusive results. The idea of unified advice for each province nevertheless became a part of nearly every reorganization subsequently proposed and eventually was to be incorporated as an important principle in the final structure for CORDS. ministerial rank and made responsible for the entire mission's psychological warfare operations and press relations. For those matters the joint office was made the central point of contact with the South Vietnamese government. Zorthian's powers were directive and included seeing that his orders were carried out; he was not merely a coordinator. Officers from his agency and from all US agencies in South Vietnam served under him. The Joint Public Affairs Office was a successful smaller pre­cursor to CORDS for the management of programs that cut across agency lines. 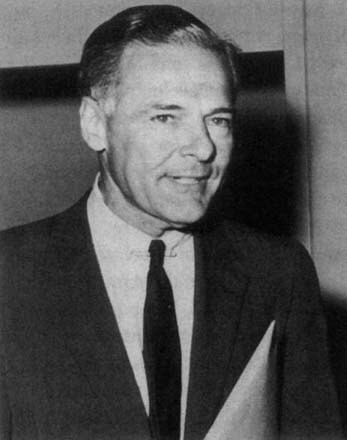 When Henry Cabot Lodge returned for a second tour as ambassador in July 1965, he came armed with a letter of authority from President Johnson as powerful as that earlier given to Taylor.14 Yet Lodge continued to see himself primarily as the president's personal representative, and his earlier reluctance to interject himself in a managerial role continued. 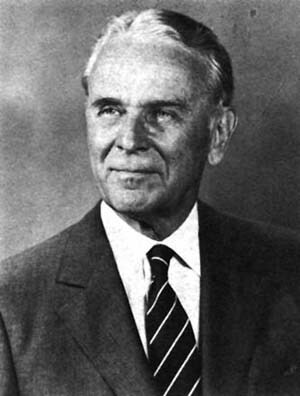 Ambassador Lodge did bring with him to Saigon a small, hand­picked team of specialists to serve as an informal political staff for his use and to provide liaison with South Vietnamese officials responsible for pacification. The head of the group, Maj. Gen. Edward G. Lansdale, US Air Force, had helped defeat an insurgency in the Philippines soon after World War II and had headed a staff advising President Diem on pacification. Lodge made Lansdale chairman of an interagency mission liaison group, which Ambassador Taylor had earlier created to provide coordination with the South Vietnamese Director General of Rural Reconstruction (pacification). The year 1965 ended with little change in the management of the American program of pacification support. 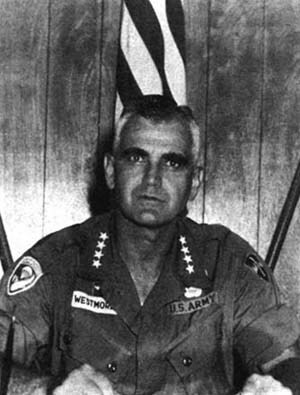 Despite a greatly expanded war, a vastly increased American effort, an enormous commitment of military and civilian resources, and a change of ambassadors arid commanders in Saigon (Westmoreland had become commander in mid­1964 ), the organization at the end of the year was basically the same as it had been two years earlier. At all levels American officials appreciated the problems of organization and made numerous proposals for change, and the president had given his ambassadors unprecedented authority. Yet the situation remained basically the same. It was not to stay that way much longer.